About fifty years ago, a major construction project began in New Delhi. Migrant workers and day laborers moved to the nation's capital and set up temporary shelters across the street from the construction site. The work continued for years, during which time the temporary shelters became less and less temporary. Fifty years later, the tents have given way to handmade brick walls, with roofs cobbled together from plastic tarps or sheets of corrugated tin. The grandchildren of these construction workers have been raised in a shantytown called the Vivekanand Colony; growing up in a neighborhood that's officially "illegal." At any point, the government of Delhi could raze the entire colony, forcing hundreds of residents into homelessness. What's striking about being in this colony is the work ethic and indefatigable spirit of the residents. In grinding poverty, without electricity or running water, children play happily with kites they've built out of discarded plastic bags. Every person you meet invites you into their home and offers you tea or bottled soda. The optimistic and friendly nature of the residents of the Vivekanand Colony never ceases to amaze. Raju Tailor was one of the first residents of the colony that I met. Two years ago, he invited me into his tailor shop and offered me a cold drink. We've talked for hours since then. His story is amazing. Raju watched his father and grandfather toil as laborers in Delhi's heat, and made a bold move. At fourteen years old, he broke with caste and tradition, leaving the family trade and working as an apprentice to a tailor. 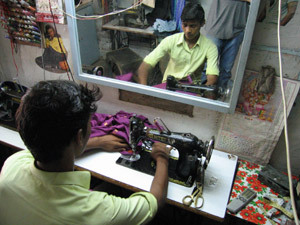 Within three years he had learned enough to open his own shop, mending clothes and hemming saris. 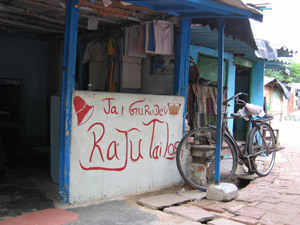 His shop has grown, and now employees three other residents of the Vivekanand colony. They sew their clothes in the time-honored fashion: on an old-fashioned manual sewing machine. Working with Raju Tailor, we designed a socially-responsible project to help the residents of the Vivekanand colony. A yoga mat bag that would appeal to American yoga practitioners. To people who are worried about child labor in overseas sweatshops. To people who want their purchases to make a difference.